I have a little quiz for you today, some bible trivia. I will quote the first part of a popular scripture and let’s see if you can complete it. Ready? This is the day the Lord has made, let us rejoice and be glad in it. Did you get it right? That’s Psalms 118:24. It’s saying God has made this day, now here’s what we should do with it – celebrate and be happy about it. God made the day, we should enjoy it to the max. No doubt God made this day, but will we rejoice? Will we be glad in it? Will we live it like it’s a gift? Will we squeeze every last ounce of goodness out of this day? Will we fill it with good thoughts and good deeds, or will we not? Will we thrive in this day God has made, or will we just survive? We’ve all heard of survival mode. Is that how you’re living? Are you in survival mode? I’m going to give you a few characteristics of survival mode and you can just do a little self-examination and ask yourself if it applies to the way you’re living. SURVIVAL MODE: You simply do what you have to do, the bare minimum just enough to get by. You sleep as much as you possibly can and you only get up when you have to. You wear whatever is the easiest to get into. Pajamas are optimal, but sweats or yoga pants if you have to go in public. Hair, well hair is a daily ponytail or messy bun and it gets washed sparingly. Makeup, heck no! Meals, those are every man for himself, there’s no thought, time, or preparation put into what you or your family will eat. You either grab what’s available or you go order it through a speaker. Your actions and interactions are kept to a bare minimum. The house gets a little worse every day. There’s very little energy and that energy is reserved for taking the kids to school and you’re just grateful the kids are on break right now! That’s survival mode, and this mode is reserved for a time of crisis. This mode is a means of survival when there’s a true crisis in your life, and yet the truth is many of us find ourselves living in survival mode on a perfectly good day of life. The majority of us woke up today to a good day of life. There is no crisis going on for the majority of us. And I’m going to be honest here, if you’re living in survival mode outside of a crisis in your life, you are wasting it. You were not created to live this day, free of crisis, in survival mode. On behalf of those who truly are going through a crisis, will you please, today, force yourself to get out of survival mode, and turn on thrive mode. What is thrive mode? Have you ever thought about that? We all know what survival mode is because many of us have been there. And most of us have been there when it wasn’t really necessary. But what about thrive mode? What does thrive mode look like? THRIVE MODE: It’s one part action and one part attitude. You see, in thrive mode you do more than what is required and you feel good about it. In thrive mode you wake up because you want more out of your day. In thrive more you spend your day fully awake and engaged. Wherever you are, you are there fully. You opt to wear what looks good on you and feels good on you, instead of what’s easiest to slip into. You accessorize. Man, you fancy it up so when you catch a glimpse of yourself in the mirror you question whether it might be a special occasion that you forgot because, whoa, you look good! Today is worthy of false lashes and lipstick, even in the house. Meals are planned, prepared, and served on time. Your family can count on you to show up on time with joy. The house is tidy and within 30 minutes could be company ready. And in thrive mode, as we say around here, you G-S-D, Get Stuff Done. You use your time wisely according to your priorities. And you do all of this not because you have to, but because you get to. In thrive mode your thoughts are filled with gratitude and your words are filled with love. Your energy is inspiring and you have more than enough. You’re not living in a world of lack, you’re living in a world of abundance. You’re not filled with worry, you’re filled with faith. You’re not surrounded by darkness because you are a light and you are reaching out and helping those who are in a crisis. I’m inviting you today, on behalf of our sisters who are in a crisis, to live in thrive mode today. 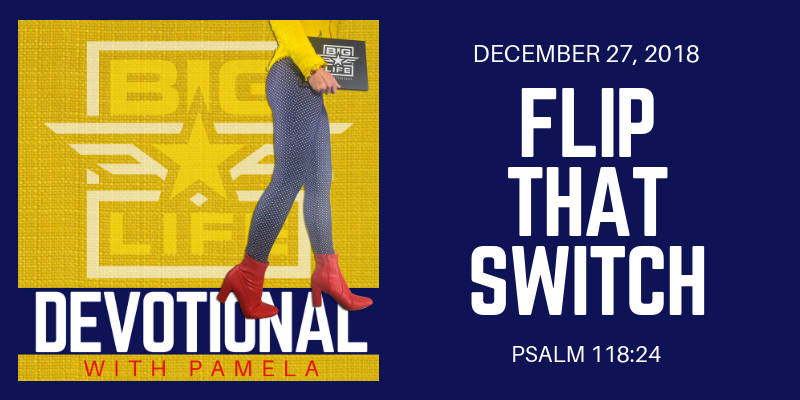 FLIP THAT SWITCH! TURN IT ON SISTER! You need to thrive. If you’re not in a crisis, you need to live in the attitude and action of thrive mode so you can help those who are in survival mode for a reason. Ask yourself today, is this a day that the Lord has made? Yes, it is. Will you rejoice and be glad in it? How can you rejoice and be glad in it? How can you celebrate and be happy about it? Well if you’re not in the middle of a crisis, you should live in thrive mode in action and in attitude. That means there are a whole lot of us that better be looking good today. There are a whole lot of us that better be gettin’ some stuff done today. There are a whole lot of us that are going to be cooking good meals for our family. A whole lot of us are going to be light in a world of darkness. And there are a whole lot of us who are going to be reaching out and helping those who are in crisis. If we are not in crisis ourselves, someone around us is and it’s time to get our crap together so we can help. Everything you do today is not because you have to, it’s because you get to. Everything around you today, every dish, every piece of dirty laundry, every chore and every task. Driving to work and hitting the grocery store, setting the table and wiping butts. It’s all because of a blessing. It’s directly tied to a blessing. Today you don’t have to, today you get to. This is a day that God has made, he hand crafted it especially for you, staying up all night to get it ready for you. You are going to rejoice and be glad in it in thrive mode. Yes? Are you with me today sister? It’s going to be a good day of life!